As the countdown to Jurassic World: Fallen Kingdom gets ever shorter, LEGO has joined the number of companies releasing new promotional material for the film, dropping a new set of “choose your own adventure” videos themed around the film! The child-friendly videos simplify the basic plot of the new film, revolving around Owen Grady and his quest to “Rescue Blue”, before the volcano on Isla Nublar erupts and disaster strikes. Viewers are given the option of making various decisions for Owen, whether it’s which mode of transportation to use to escape a dinosaur or how to get off the island, all leading up to the final conclusion. Screenshot from “Rescue Blue”, the first short in the adventure series. The adventures come in thirty to sixty second increments, with each choice either leading to disaster – like crashing a truck or getting shot in the foot with a dart gun – or continuing the story on to its conclusion. But don’t worry; if you choose the disastrous option, the ends of each video allow you to remedy your choice to continue the adventure. No use of the “previous page” button necessary! The videos also feature Claire and new Fallen Kingdom character Franklin (as played by Justice Smith) in non-speaking roles, along with several recognizable dinos, including a carnotaurus and dilophosaurus! Counting the disastrous options, the “short film” is split into seven videos, totaling about five minutes and thirty seconds, and all are available to view on LEGO’s YouTube channel. Check out the first one below, and take your own adventure! Jurassic World seems to have quite the presence at New York City’s Toy Fair this year, with news and merchandise announcements pouring in left and right. In addition to the announcement of Mattel’s Fallen Kingdom line from earlier, the franchise also has multiple figures on display at the Toy Fair, as seen below. Figures displayed include some of the new Fallen Kingdom action figures, including sculpts of the stygimoloch (or “stiggy”, as it’s being called on the product packaging) and carnotaurus that fans saw in the trailer. A preview of some of Jurassic World: Fallen Kingdom’s upcoming merchandise. Some of the new articulated dino action figures, including a carnotaurus and a stegosaurus. More articulated dino action figures! Some of the new story pack playsets that will be available, featuring Blue, Owen, Claire, and a gyrosphere. No information has been released on when these toys will be available, but they certainly look gorgeous, and it seems like there will be a wide variety of products coming to us very soon. The official Jurassic World social media accounts have also been previewing some of the merchandise, with cameos from Bryce Dallas Howard herself, who attended the fair to promote the new products. By the looks of it, everything from Lego sets to new Jurassic World-themed fashion has been put on display at the Toy Fair, with several sneak peeks available on the official JW Instagram story. News on the new young adult novel centered on Claire Dearing has also been released! Bryce Dallas Howard previewed the novel’s cover on the official Jurassic World Instagram, and we now know the official title of the novel: Jurassic World: The Evolution of Claire. Freshman year in college is full of obstacles one must learn to overcome – messy roommates, dining hall food, and cranky professors are just a few. Never has a student added, “How to properly avoid being eaten by a dinosaur,” to her list of freshman year complications, but Claire Dearing isn’t just any student. The year is 2004. The future theme park, Jurassic World, is currently under construction. Nineteen-year-old Claire Dearing, the multi-tasking, self-possessed heroine of Jurassic World and Jurassic World: Fallen Kingdom, has chosen to spend her summer interning with the Masrani Corporation on Isla Nublar following her freshman year in college. The result is a pulse-pounding coming of age story set against the backdrop of Jurassic World advancing towards its opening day. The story begins with Claire as she starts her internship with laser-focused goals set on bettering the lives of all animals worldwide. While exploring the island, and performing various theme park/dinosaur-related tasks, Claire quickly forms a tight bond with her fellow interns while also making a name for herself amongst the senior members of the Jurassic World staff. It isn’t long before romance sparks between her and a fellow student, which leaves Claire conflicted once a larger, and more sinister plot develops, forcing her to question the motives of everyone on the island. Over the course of a thrilling mystery full of intrigue and suspense, this novel details the origins of Claire’s nuanced character in a rich and complex way, allowing the reader to witness the transformative moment when Claire begins constructing walls around herself, and steps forward as the guarded character we meet in the first Jurassic World film. In addition to books and toys, Jurassic World also released news of upcoming Fallen Kingdom Pop! Funkos. 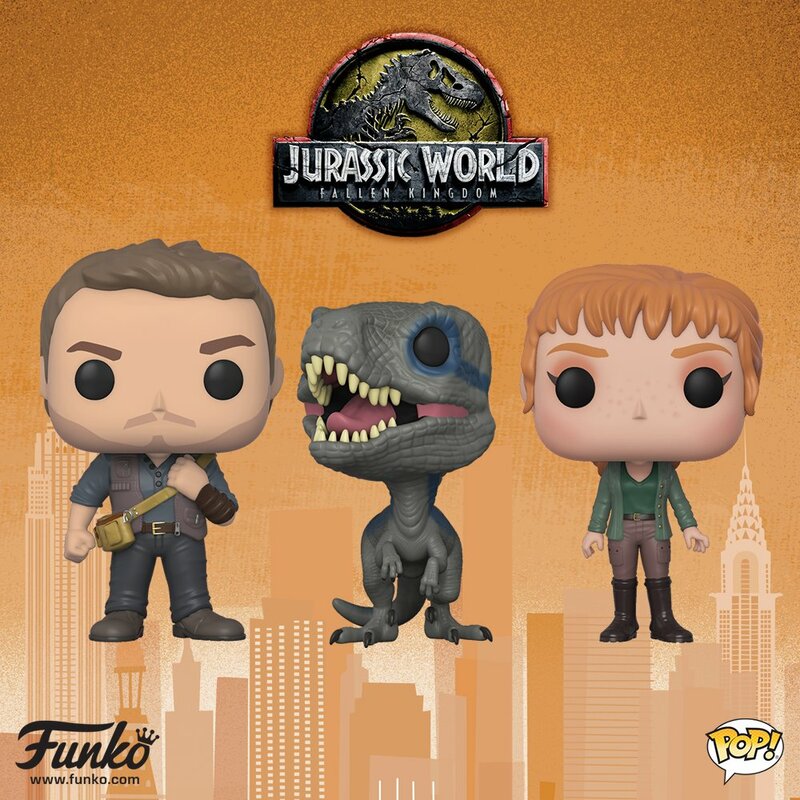 Funko announced the release of three new Fallen Kingdom collectible figures on their Twitter, in addition to showing them at the fair. Owen Grady, Claire Dearing, and Blue will all be available for purchase in May. Stay tuned for a detailed first-hand write up of all the new Jurassic World merchandise, featuring HD photos and videos of all the new products! First Look at Packaging Art for Jurassic World: Fallen Kingdom Merch! Our first look at packaging art for Jurassic World: Fallen Kingdom products is here! Several listings for Jurassic World: Fallen Kingdom products showed up in a recent PEZ sales brochure, including several listings of dinosaur-shaped PEZ dispensers featuring the likenesses of Tyrannosauruses and raptors, as well as the dilophosaurus and mosasaurus. However, the stand out of these listings is that of the packaging’s key art, which features a profile image of Blue, along with the grittier Fallen Kingdom version of the Jurassic World logo and a background image of an erupting volcano. This design seems to be the general format for other products – such as those being released by LEGO and Mattel – with Blue being the centerpiece for all of the packaging. And, since that is the case, this marks the first time that a Tyrannosaurus or other large, headlining dino (like the spinosaurus from Jurassic Park III) has not been the focus of packaging art for the franchise. The art for Jurassic World (pictured below) featured a head-on image of the Tyrannosaurus, as well as the sleeker, blue and silver version of the JW logo. What this means for the franchise and products yet to come, we have yet to find out, but a different turn is always exciting. Let us know your thoughts on the packaging in the comments below and on our forums! New Jurassic Park Collectibles Coming Soon from Iron Studios! Looks like the market for Jurassic Park collectibles is expanding – Iron Studios, a collectibles company based in Brazil, has acquired the license to produce official Jurassic Park products! On their website, the studio describes themselves as “a developer and producer of highly detailed collectible figures…the first Brazilian company with 100% official products aimed at collectors”. Currently, the studio also produces officially licensed collectibles for DC Comics, Star Wars, and Marvel Comics, geared towards “fans passionate about their favorite pop culture characters and the hobby of collecting”. The first pieces of Iron Studios’ Jurassic Park collection will be unveiled in December at Comic-Con Experience (CCXP) in Brazil, one of the largest comic conventions in the world. The studio is working closely with Universal Pictures to create a exciting presentation that will do justice to the legacy of the franchise. While the first items to be released will be from the original film, the studio is open to producing collectibles from other Jurassic Park films – including Jurassic World Fallen Kingdom – in the future. No word yet on what characters will be featured in this first release, but since Iron Studios primarily produces human figures, perhaps fans can expect to see something of the original trio from the first film. Iron Studios wants you to know they are huge fans of the Jurassic Park franchise, and are investing a lot of time and effort in the project to make the best products possible for fans. More information on the collection will be released on the studio’s Facebook page in the coming weeks as CCXP rolls around. Are you excited about these new products? What collectibles are you hoping to see? Let us know in the comments, and stay tuned for updates! You can follow Iron Studios on Facebook, Instagram, and YouTube.